Every single of my Gieszer-Bru dolls is custom built. It´s a unique experience to see the doll getting its distinctive personality and its own character and expression. The doll heads are made of pure white biscuit porcelain, as well as the chest plate and the arms. The porcelain is burnt at 1230° Celsius. Then I do the skin tone, which also has to be burnt in and the overall painting. Next steps are tinting of the cheek, painting eyelashes and eyebrows and further decoration firing. The bodies of my Gieszer-Bru dolls are faithfully reproduced after a vintage doll. The inner parts consist of metal and wood and are covered with finest sheep nappa leather. These bodies were built in 1880 under the name "chevrot-body". Instead of the lettering "BebeBru", my reproduktionsobtain the writing "Gieszer-Bru" at the chest label and are therefore recognized as reproductions. All of my dolls are signedwith my Name "Margit Gieszer" behind their left ear. I myself manufactured the form of the legs according to antique legs of an original Bru doll and that´s why all my dolls legs are identical to the legs of the original Bru dolls. Unlike the original made of wood they are now made of ceramics. On demand it is possible to have wooden legs mounted. As many of my customers are museums and collectors of antique dolls who want to complete a missing antique Bru doll with my reproduction, all my Gieszer-Bru dolls receive an antique finish patina. The clothing is made of old fabric or new silk with vintage lace matching the type of the doll. The templates for the doll clothing are partly from fashion magazines of the year 1880. To complete the outfit, I add finest leather shoes or boots. The wigs are made of mohair. Upon request, I can also use European real hair. Each wigs are handmade. 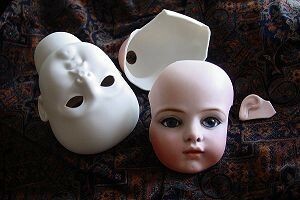 All dolls are collector´s items and therefore not suitable for children, as the porcelain may be fragile. It is sufficient to dust them with a smooth cloth. Wigs of dolls with hand knotted real hair ore mohair wigs are washable, but have to be taken off before. This should be left to a skilled specialist. Also the clothing may be washed at 30 degrees (hand washing recommended). No liability is assumed for damages resulting from improper handling. Please treat the dolls as unique antique collector´s items, and you will enjoy them for decades.